Exploration of a range of areas and habitats. Mountains, lakes, forests, Kumaoni villages and wildlife reserves. 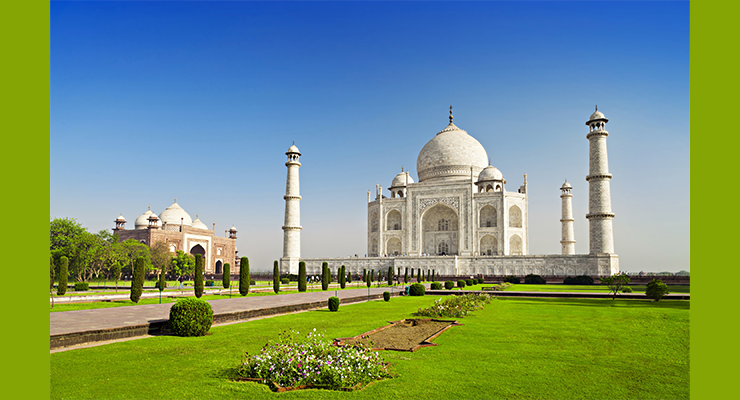 This multi faceted tour gives you a taste of some iconic experiences India has to offer. A visit to Indias capital city, Delhi and the world renowned Taj Mahal in Agra. It aims to provide a glimpse of the natural, architectural, historical and cultural sights of Himalayan India. You get to explore a range of areas and habitats like mountains, lakes, forests, Kumaoni villages and wildlife reserves nestled in the rich and diverse Himalayan region too. We start with the capital Delhi where you spend the first night. You can opt for a guided tour to see the famous architectural gems of the Mughal or British times or enjoy the array of cuisines and cosmopolitan experiences it offers. Iconic Taj Mahal and Fatehpur Sikri visit come next as we take you to Agra on a lovely train ride. Next, we take you to explore the magnificent beauty and diversity Himalayas offer. With camping and birding at the foothills of Himalayas, we also spend time at the famous Corbett Tiger Reserve. Enjoy jeep safaris or an elephant ride for tiger and another wildlife viewing. Enjoy birding around the area early in the morning as you spend two nights at the quaint Tiger camp resort. Corbett is a popular retreat for wildlife and nature enthusiasts. It provides a great opportunity for viewing wildlife, especially the tiger in its natural habitat. The main wildlife animals found in the Corbett National Park include the Tiger, Elephant, Chital, Sambar, Nilgai, Gharial, King Cobra, Muntjac, Wild Boar, Hedgehog, Common Musk Shrew, Flying Fox, Indian Pangolin and nearly 600 species of birds. Next, we take you to explore Jageshwars ancient 8th -12th century Shiva temples. Counted among the 12 Jyotirlings in the country, Jageshwar lies in a beautiful narrow valley hedged by monarch-sized, ancient deodars. Exquisite ancient ruins, beautiful Himalayan vistas, gurgling stream nearby, Jageshwar offers a spiritual retreat. With morning Yoga sessions and options for massage as well, you can choose to soak in the spiritual energy of this holy area or go for hikes in the surrounding woods. A picnic on the cool riverside is also a very enticing option. For those seeking an adventure, we take you thrilling rafting experience from Rameshwar to Pancheshwar on river Saryu very close to Abbot Mount. We move on to the historic hamlet of Abbott Mount next. It was founded by and named after Mr. John Harold Abbott, an English businessman who wanted to develop a hill station for the European community in the 20th century. There are only thirteen secluded cottages spreads over this private hill. There is a picturesque church set amidst the forest and an ancient cricket pitch with an unsurpassed view of the mountains. This is an ideal destination to relax and connect with nature. Long walks in the woods, reading a book as you sip tea in the sprawling lawns, spotting birds chirping in the foliage or enjoying the lovely meals provided in this quaint 100-year-old lodge. It is a perfect mountain break. The birding paradise of Pangot is next on our list. The entire drive to Pangot is mostly through the forested area of Cheena Peak Range via Snow View Point and Kilbury, the main habitats for wildlife. The stay at a quaint eco-lodge called Jungle Lore Birding Lodge is also a highlight of this sleepy hamlet. The spectacular views and warm hospitality adds to the charm of the experience. You can enjoy birding or a trek with our guide. You can hope to see Blue Whistling Thrush, Red-Billed Blue Magpie, Blue-Capped Redstart, Streaked Laughing Thrush, Grey-Backed Shrike, Yellow-Breasted Green Finch etc. You pass through small Kumaoni villages, where you can see simple hill folks indulge in their everyday household chores, thrashing wheat or taking their sheep for grazing. Beautiful local architecture, slate and mud houses, carved doors and windows make very interesting photo opportunities. You can choose to stay at such a traditional house or tented camps or forest bungalows. Spending time chatting with these friendly villagers, hearing their music, sharing their food is an unforgettable experience. Driving back to Delhi at the end of two weeks, you would have seen some of the unforgettable natural, architectural, historical and cultural sites that India has to offer. You will be met and driven to Agra in the morning (3 hours). Full day guided tour of Agra and Fatehpur Sikri. Overnight stay in a hotel. Drive from Agra to Kuchesar Fort (6 hours). The Mud Fort is a heritage hotel located in Kuchesar. The fort served as the erstwhile seat of Jat Kingdom of Uttar Pradesh. This mid-18th-century fort has been excellently preserved and transformed into one of the most exotic heritage hotels in India. Overnight stay. Today we drive to Corbett Tiger Reserve. Check-in at Tiger Camp for the overnight stay in comfortable cottages. Afternoon safari into the jungle for bird watching, wildlife & Tiger viewing. The jungle visits last for about three hours. Return to Tiger Camp for dinner. Morning safari through the open chaurs (grasslands) and mixed forests in Bijrani Range Forest, a safari that would last about 3-4 hours. Return for breakfast. After lunch, you may opt for an elephant ride at Tiger Camp and you will have ample time to study the behavior of this magnificent and intelligent mammal. Or you may go bird watching with a guide. Overnight stay in comfortable cottages/rooms. The morning is spent experiencing the real wilderness of Corbett National Park. You will be transferred to Ranikhet (3 hours) in the afternoon, arriving in the evening. Overnight stay in a hotel. Ranikhet is a picturesque location surrounded by hills in northern India. It is a cantonment town situated in the Almora district of the Indian state Uttarakhand. It was the place of interest for British who frequented this place to escape from the sweltering heat of the Indian subcontinent during their rule. More is known regarding Ranikhet, it is 1869 meter above the sea level and the entire cantonment town is divided into two ridges, namely Ranikhet ridge and Chaubattia ridge. There are many local myths that make up the history of the hill town. We drive to the highly sought after destination, Jageshwar calling Almora on the way to visit Katarmal Temple. About Katarmal Temple: The Katarmal Sun Temple is a monument of historical importance and also is an example of intricate sculpturing. The first rays of the sun fall straight on this Sun Temple. The main deity of the Sun temple in Katarmal is called Burhadita or Vraddhaditya (the old Sun God). The idols of Shiva-Parvati and Lakshmi-Narayana are also found in this temple. Katarmal Sun Temple complex has one main temple, surrounded by 45 smaller shrines exquisitely carved temples surrounding it. The Katarmal Sun temple, noted for its magnificent architecture, artistically made stone and metallic sculptures and beautifully carved pillars and wooden doors, the image of Surya in the temple dates back to 12th century. The Katarmal Sun temple has some unique architectural style and the images carved on the walls are very intricately done. Though amidst ruins, it still stands as a major point of attraction in the region and many devotees visit here to offer prayer to the Sun God. Overnight stay in Van Serai, a very charming lodge with local architectural sensibilities. Today we will visit Dandeshwar, Vridh Jageshwar, and Jageshwar Temples. About Dandeshwar, Vridh Jageshwar and Jageshwar Temples: The spiritual hamlet of Jageshwar is where you can explore its ancient 8-12th century Shiva temples. Counted among the 12 Jyotirlings in the country, Jageshwar lies in a beautiful narrow valley hedged by monarch-sized, ancient deodars. Exquisite ancient temple ruins, beautiful Himalayan vistas, gurgling stream nearby, Jageshwar offers a spiritual retreat. With morning Yoga sessions and options for massage as well, you can choose to soak in the spiritual energy of this holy area or go for hikes in the surrounding woods. A picnic on the cool riverside is also a very enticing option. Visit Vridha Jageshwar in the morning, it is a 3 Km trek and is the source of the river Jata Ganga. The view of the surrounding country side is very imposing and 1.5 km beyond from Hiriya Shikhar (2200 m), the view of the Himalayan peaks is awe inspiring. Overnight stay in Van Serai. Drive to Rameshwar (1.5 hours). Rafting from Rameshwar to Pancheshwar in Saryu river ending in a confluence of Mahakali and Saryu. Overnight stay in camps at Pancheshwar. Pancheshwar lies at the confluence of the Mahakali and Saryu, rivers that demarcate the Indo – Nepal border. It has historically been renowned as the home of Jim Corbett’s Champawat tiger, the sacred Chaumu temple, and the golden Mahseer. Drive to Abbott Mount (2 hr.). Visit Mayawati Ashram, the headquarters of Adwait Ashram, it was sanctified by Swami Vivekanand and is also known for its charming surroundings. Overnight stay in Abbott Mount Cottage. We will organize cooking lessons for you. A day is spent at leisure. Overnight stay in Abbott Mount Cottage. Drive from Abbott Mount to Pangot (7 hours) via Almora and Nainital. The last part of the drive is through the forested area of Cheena Peak Range via Snow View Point and Kilbury, the main habitats for wildlife. Overnight in Jungle Lore Birding Lodge. The next two nights will be spent at quaint and comfortable en-suite cottages at the Jungle Lore Birding Lodge. You can enjoy the afternoon birding or a trek with our guide near the lodge. You can hope to see Blue Whistling Thrush, Red-Billed Blue Magpie, Blue-Capped Redstart, Streaked Laughing Thrush, Grey-Backed Shrike, Yellow-Breasted Green Finch etc. The following morning will bring an exciting half-day trek to Cheena Peak (also known as Naina Peak) with a picnic lunch. Starting at the Pangot Village, we take you to a local house to see a magnificent view of Corbett National Park area and villages (where Jim Corbett killed 10ft long tiger called Bachelor of Pawalgarh). Admiring unique local architecture on the way, we stop at Dhamdhamiya for excellent views and Akhorwadi, home to a lot of walnut trees for spotting various woodpecker species and other birds. We reach Naina Peak at a height of 2311 meters for a panoramic view of the Himalayas and a close up of the peaks through a powerful telescope. On the downward journey, we get superb views of the lake city Nainital and we stop to have our packed lunch. We then head back to Pangot via Kilbury forest. Full of oak and rhododendron trees, it is a great area to spot many birds like Koklas, Kalij Pheasants, Common Kestrel, Grey Winged Blackbird, Black Red Start, Bar-Tailed Tree Creeper. Leopards, Himalayan Black Bear, Civet Cat, Porcupine, Deer and Wild Boar etc might also be sighted on the way. Trekking through the forests, you can see lovely sights of traditionally dressed villagers collecting fodder for their cattle and firewood for their homes. We arrive back at Pangot in time for tea and warmth. A bonfire is a perfect end to the evening around which the experiences of the trek can be shared. Drive back to Delhi (8 hours). You will be transferred to the airport for your journey home. Tour ends.